One of the other patterns I bought during a Peek-a-Boo sale was the Hang Ten Rash Guard. It was really easy and quick to make. I made size 3. But unfortunately, it didn't go over Mr. A's head! I need to make the neck opening larger for the next one. 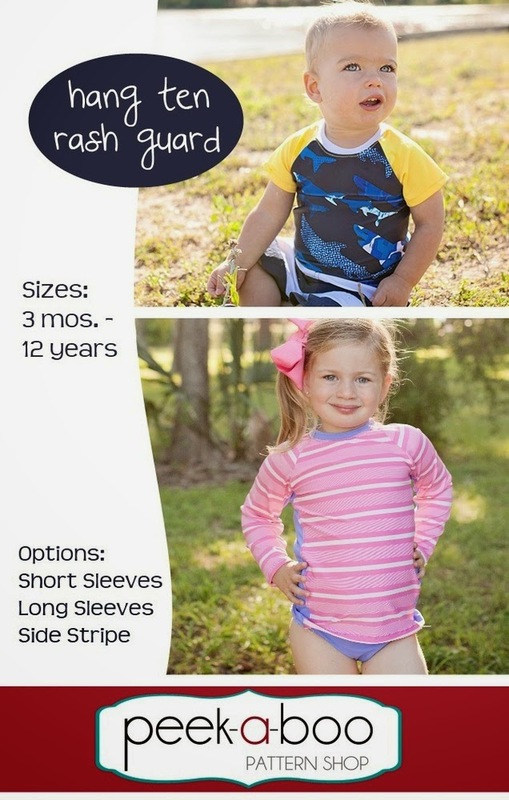 Miss C needs a rash guard too, so I'll be making two very soon. I also made 2 pair of Seamus Trunks from Ottober 03-2009-40. Cindy very kindly sent me the magazine so I could make this pattern. It's she just the sweetest? Thank you again, Cindy. The trunks fit Mr. A perfectly. In fact they are completely adorable on him. I didn't get a photo because while we were trying them on, we were all ooohing and aaahing over his adorable-ness and I forgot to grab the camera! Doh. Funny thing about the trunks. His mom only likes boxer style swimmers. These are more European looking and I knew I was truly testing the waters (pardon the pun) with this style of swim wear. But when he put them on and her friends and husband were squealing with delight, not to mention Mr. A who liked them too, my daughter quickly changed her mind. The power of peer pressure! The trunks were easy and quick to make but I did have a problem getting the piping to sit flat and not pucker. When they are worn, the puckers disappear so I worried needlessly. I plan to make another pair but will add length to the leg. Awesome swimmers! Where did you get the fabric? Oh, that fabric is just wild....love it. Very cool Deb. Aussie kids usually wear long sleeved rashies to keep the UV rays at bay. I've been looking out for a pattern, but had envisaged one with a short zip at the back neck to allow for heads to go through neckholes . Would be great if it came together with shorts, huh? Love the little trunks you've made. You are very much welcome, Deb! The swimmers are super cute. Very smart to make rashguards to go with them!